How Do I Review A Yoghurt? This is a good thing, because if I had to eat as much as I exercise to keep this blog ticking over my life would be a constant circle of writing about Cadbury’s giant chocolate buttons and the excellent XXXL fashionwear available from Jacamo. But now the dust has settled on my recent triathlon adventure, the bike wheels have stopped turning and the waves have subsided on the lake, I really should give a mention to my sponsors…and possibly the fourth discipline of a triathlon, fuelling the body. I was lucky throughout training to receive box after box of Chobani yoghurts. I lost count of how many boxes, but enough that I wasn’t without a pot for the 5 weeks prior to the Jenson Button Trust Triathlon and for a week or two after. That’s 7 weeks of free yoghurt. You can imagine the pain of going cold turkey when I ran out…luckily I’ve found a local stockist to feed my new addiction (Tesco, Tewkesbury Road, Cheltenham). I don’t know what most of that means, but I do know that they taste amazing! The thick and creamy claim is totally founded, in fact when I opened my first one it was so thick I thought it was going to be chewy! But as soon as the spoon sunk in to it through to the real fruit in the bottom I knew I was in for a treat. This prompted a debate, in fact I thought about starting an online poll but I had to go for a training swim instead. So I’ll just tell you how I enjoyed Chobani yoghurts…I’m a stirrer. That’s right, I rip the lid off, get in there with the spoon and give it a stir until the whole pot is a fruity yoghurt concoction. I know some of you are fruit at the bottom folk, there is no wrong or right, we’re just different (but you are wrong). 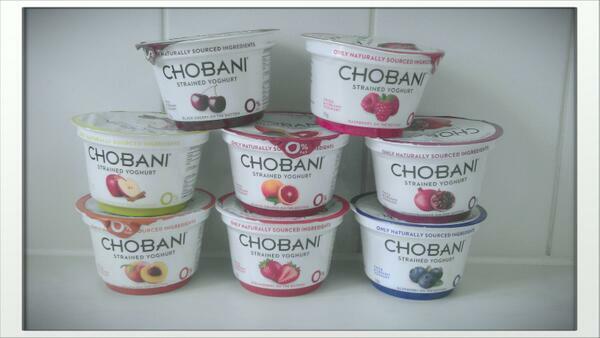 There’s 8 flavours of fruit Chobani available. I won’t list them, I’ll let you discover them for yourself, but I can confirm I would fight to the death for the last black cherry, blood orange or pomegranate Cho in the fridge. I wasn’t such a fan of the apple & cinnamon flavour but luckily my Nan was, so they went somewhere they were appreciated. This is a woman with many decades of dessert experience, a daily consumer of the finest yoghurts available in the Co-op, and she says Chobani is delicious. There can be no higher praise! They also have a plain yoghurt in the range. There are people who can pour this on some nuts and seeds and call it breakfast. These people are slightly unhinged and should be seeking psychiatric help. However, I started adding a big dollop to my morning banana smoothie and it revolutionised an already excellent start to the day. While the fruit flavours have become a (far from occasional) treat, the plain is now a permanent addition to my fridge. Chobani also have a webpage full of recipes so anyone looking to boost their protein intake can do so easily while eating some delicious meals and snacks. So much better than throwing whey powder in to everything! Are you fruit at the bottom or stirred? Comment and let me know. This entry was posted in Kit, Life, Training, Triathlon and tagged Chobani, Diet, Food, Jenson Button Trust, review. Bookmark the permalink. 2 Responses to How Do I Review A Yoghurt? I need to check out the recipes! Because clearly I need more excuses to eat Chobani! I am actually a lick-the-lid, fruit first person and I take a small slice out of the creamy top before trying my best to scrape all of the fruit from this small gap and then allowing myself the rest of the yoghurt. It’s the only way to eat the yoghurt. Amusement in a pot! Like a yoghurt miner, certainly sounds like a fun technique!